After her divorce, relatives refused to help. Now Kamu Sunar is the one people come to for help and advice. A little boy comes to Kamu Sunar’s shop. He chooses a chocolate bar and hands over the money. He has already turned to leave when Sunar reminds him to take the change with him. Kamu Sunar’s shop takes up one room in a two-storey stone building on the narrow main street of the village of Bhardeu. The shop sells a variety of items from soap and bracelets to shoes and petrol. The small village of Bhardeu is located in a verdant valley right in the middle of Nepal. 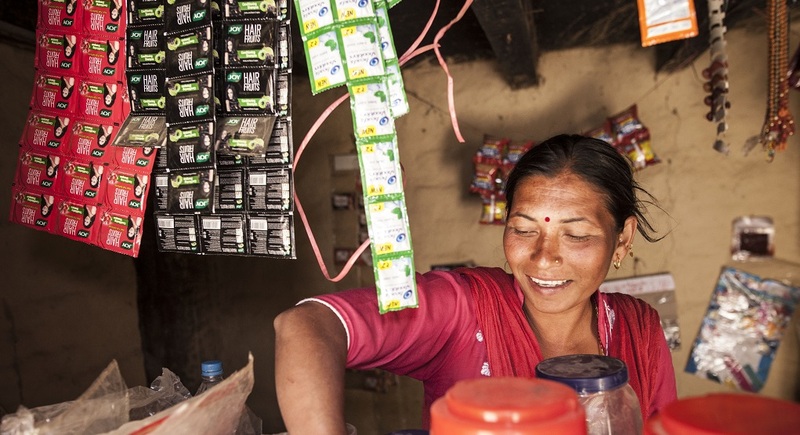 Sunar is a Dalit, or an outcaste, as well as an entrepreneur and a single mother. Now, she is also a municipal councillor on the Nepalese rural municipal council Gaupalika, meaning she gets to participate in local decision-making. For several years, a women’s cooperative supported by the Finn Church Aid volunteer network Women’s Bank has operated in Sunar’s home village. The women who belong to it have received education and support for e.g. saving and agriculture as well as starting their own small businesses. The members of the cooperative have improved their financial and social position, but according to the women, equally important has been an improvement in self-esteem, team spirit within the group, and support from others. And when a municipal election was held in Nepal, the women of Bhardeu decided to join forces. They voted for Kamu Sunar, a respected member of the group who had a slightly better chance of being elected, thanks to a Dalit quota. When she was elected, it was a victory for all of them. In politics, Sunar wants to promote the financial and mental empowerment of women. In Nepal, the situation of women is still poor, and not everyone thinks rights such as ownership rights and financial power of decision belong to women just like they do to men. Remote Bhardeu has not always been home for Kamu Sunar. Her childhood was spent in the capital Kathmandu where her parents had a goldsmith shop. Her childhood as the eldest daughter of a family with five children was a happy one. Kamu Sunar sighs. Now comes the most painful part of her story. A young man visited the goldsmith shop. A couple of decades ago, love matches were much less common in Nepal than they are today. The newlyweds moved to the groom’s home village of Bhardeu. They were happy together for ten years. ”Then he found someone else. I don’t want to talk about it any more than this. He betrayed me. I don’t want to think about him,” says Sunar. When her husband left her, Sunar and her young children, a girl and a boy, were left destitute. The family of the husband did not want to help them. Being a member of the women’s cooperative helped Sunar rearrange her life. Little by little, Sunar acquired both skills and capital. She got a loan of 15,000 Nepalese rupees (110 euros) to start her own shop. Having her own shop had been a lifelong dream. The shop was a success. Both of her children got the chance to stay in school for as long as they would like. We close the shop for a while and go see Kamu Sunar’s construction site. She is about to fulfil another dream, a home of her own. Her time living in her ex-husband’s brother’s house is coming to an end. The house is not even safe, because it was damaged in the powerful earthquakes of 2015. Sunar’s small plot of land is within walking distance of the shop in this beautiful valley in which the village is located. Houses are scattered few and far between in the valley, surrounded by meadows and terraced maize and mustard fields. In this country known for its snowy peaks, the tall green hills surrounding the valley cannot be called mountains. At the plot, Sunar’s daughter and a friend are working in the heat of the sun, crushing rocks. You can also buy crushed rock, but it is cheaper to make your own. Soon there will be a small house on the plot that belongs to no one but Sunar. It feels wonderful. Tomorrow, 14-year-old daughter Amrita can leave crushing rocks behind and gets to go to school, as the school year starts. ”Amrita is stronger than I am. She talks a lot and has lots of suggestions,” says Sunar. Amrita is interested in a career as a volleyball player. ”She gets to choose herself,” Sunar assures us. Her 18-year-old son Amit works in a goldsmith shop in Kathmandu, but often visits his mother and sister. ”Mom is kind-hearted and funny. And a little strict. Mom used to be very quiet, but not anymore. I’m really pround of her being on the council,” says Amrita. Outcaste people still face many kinds of discrimination in Nepal. ”I’ve suffered a lot because I’m outcaste. But I have learned a lot as well. I’m here now because I have had so much support,” says Sunar. According to Sunar, all members of the council are like one big family. Sunar knows from experience exactly what kind of skills a woman needs in order to improve her situation in society. She is now in a position to give advice and help others. Being on the council only pays a small fee, and the 460 municipal councils of an impoverished country do not have a great deal of funds to hand out for local development. 18 percent of the funds are especially reserved for supporting women. This is better than nothing at all. ”My mind used to be empty. Now I have lots of knowledge, skills and ideas,” describes Sunar.